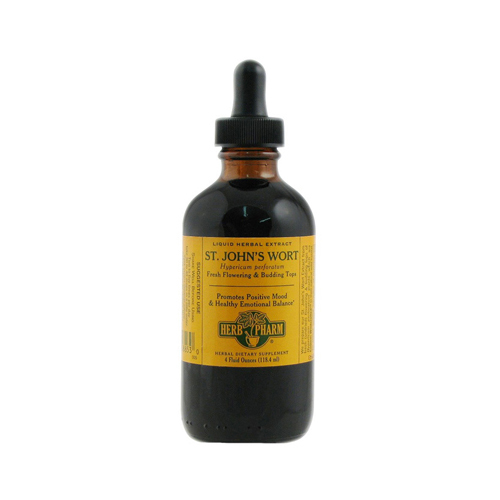 Herb Pharm St. John's Wort Extract promotes positive mood and healthy emotional balance. St. John's Wort Extract comes from fresh (undried) flowering and budding tops of Hypericum perforatum plants which are custom wildcrafted in their natural wild habitat. Herb Pharm St. John's Wort Extract is a Single herb extracts, a solitary herb, typically in a base of certified organic alcohol. All of Herb pharm single herbal extracts are prepared according to precise good manufacturing practices and with individualized formulations or processes, which enable each herb to be extracted according to its own unique physical and biochemical characteristics. This attention to detail produces a finished extract which optimally represents the herb from which it was made. Herb Pharm extracts are very rich in the aroma, taste and bioactive compounds of the original herbs themselves. Herb Pharm uses pharmaceutical-grade, certified organic alcohol to make over 90% of our liquid herbal extracts. Disclaimer These statements have not been evaluated by the FDA. These products are not intended to diagnose, treat, cure, or prevent any disease. Ingredients: Certified organic grain alcohol and St. John's Wort extractives. Warnings Keep out of the reach of children.